For decades, Lexington grew modestly while remaining largely a farming community, providing Boston with much of its produce. It always had a bustling downtown area, which remains to this day. Lexington began to prosper, helped by its proximity to Boston, and having a rail line (originally the Lexington and West Cambridge Railroad, later the Boston and Maine Railroad) service its citizens and businesses, beginning in 1846 (turned into a bikeway in 1992). For many years, East Lexington was considered a separate village from the rest of the town, though it still had the same officers and Town Hall. Most of the farms of Lexington became housing developments by the end of the 1960s. Lexington, as well as many of the towns along the Route 128 corridor, experienced a jump in population in the 1960s and 70s, due to the high-tech boom. Property values in the town soared, and the school system became nationally recognized for its excellence. The town participates in the METCO program, which buses minority students from Boston to suburban towns to receive better educational opportunities than those available to them in the Boston Public Schools. On April 19, 1775, what many regard as the first battle of the American Revolutionary War was a battle at Lexington. After the rout, the British march on toward Concord where the militia had been allowed time to organize at the Old North Bridge and turn back the British and prevent them from capturing and destroying the militia's arms stores. Lexington was the Cold War location of the USAF "Experimental SAGE Subsector" for testing a prototype IBM computer that arrived in July 1955 for development of a computerized "national air defense network" (the namesake "Lexington Discrimination System" for incoming ICBM warheads was developed in the late 1960s). Lexington is located at 42°26′39″N 71°13′36″W﻿ / ﻿42.44417°N 71.22667°W﻿ / 42.44417; -71.22667 (42.444345, -71.226928). By the 2010 census, the population had reached 31,394. As of the census of 2010, there had been 31,394 people, 11,530 households, and 8,807 families residing in the town. The population density was 1,851.0 people per square mile (714.6/km²). There were 12,019 housing units at an average density of 691.1 per square mile (266.8/km²). The racial makeup of the town was 68.6% White, 25.4% Asian (15.4% Chinese, 4.8% Asian Indian, 3.2% Korean), 1.5% Black or African American, 0.1% Native American, 0.0% Pacific Islander, 0.5% from other races, and 2.6% from two or more races. Hispanic or Latino of any race were 2.3% of the population. There were 11,530 households out of which 38.6% had children under the age of 18 living with them, 66.0% were married couples living together, 7.7% had a female householder with no husband present, and 24.1% were non-families. 20.8% of all households were made up of individuals and 12.3% had someone living alone who was 65 years of age or older. The average household size was 2.66 and the average family size was 3.10. In the town, the population was spread out with 26.4% under the age of 18, 3.5% from 18 to 24, 22.7% from 25 to 44, 28.5% from 45 to 64, and 19.0% who were 65 years of age or older. The median age was 44 years. For every 100 females, there were 88.7 males. For every 100 females age 18 and over, there were 83.5 males. In 2013, the mean home price for detached houses was $852,953, and the median price of a house or condo was $718,300. According to a 2012 estimate, the median income for a household in the town was $191,350, and the median income for a family was $218,890. Males had a median income of $101,334 versus $77,923 for females. The per capita income for the town was $70,132. About 1.8% of families and 3.4% of the population were below the poverty line, including 3.2% of those under age 18 and 3.4% of those age 65 or over. By race, the median household income was highest for mixed race households, at $263,321. Hispanic households had a median income of $233,875. Asian households had a median income of $178,988. White households had a median income of $154,533. Black households had a median income of $139,398. American Indian or Alaskan Native households had a median income of $125,139. In 2010, 20% of the residents of Lexington were born outside of the United States. Lexington's public education system includes six elementary schools, two middle schools, and one high school. Overall the Lexington school district is among the top ranked in the state and nationally. Bridge Elementary School and Jonas Clarke Middle School were High Performing National Blue Ribbon Schools in 2010 and 2013 respectively. They have been ranked as top schools based on Massachusetts Comprehensive Assessment System (MCAS) test scores. Lexington High School was ranked in 2014 as the 19th best high school in the nation by U.S. News. In 2012, 2017, and 2018, Lexington High School won the U.S. Department of Energy (DOE) National Science Bowl competition. In addition to Lexington High School, students may attend Minuteman Regional High School. The Lexington Chinese School (LCS; 勒星頓中文學校) holds its classes at Belmont High School in Belmont. In 2003 over 400 students attended classes at LCS, held on Sundays. Old Belfry in Belfry Hill Park, Clarke Street. 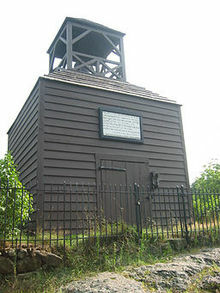 Its plaque reads: "This belfry was erected on this hill in 1761 and removed to the Common in 1768. In it was hung the bell which rung out the alarm on the 19th of April 1775. In 1797 it was removed to the Parker Homestead in the south part of the town. In 1891 it was brought back to this hill by the Lexington Historical Society. Destroyed by a gale in 1909. Rebuilt 1910." Lexington is home to the Lexington Symphony, which performs regularly at Cary Hall. Major employers in Lexington include the MIT Lincoln Laboratory, Stride Rite, Agilent, Global Insight, CareOne, the Cotting School, Ipswitch, and Lexington Public Schools. MBTA Bus operates three routes that connect with the Red Line at Alewife station in Cambridge. Lexington is most well known for its history and is home to many historical buildings, parks, and monuments, most dating from Colonial and Revolutionary times. 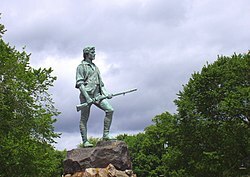 One of the most prominent historical landmarks, located in Lexington Centre, is the Common, or as it later became known, the Battle Green, where the battle was fought, and a statue of John Parker, captain of the Lexington militia stands. Another important historical monument is the Revolutionary Monument, the nation's oldest standing war memorial (completed on July 4, 1799) and the gravesite of those colonists slain in the Battle of Lexington. Other landmarks of historical importance include the Old Burying Ground (with gravestones dating back to 1690), the Old Belfry, Buckman Tavern (circa 1704-1710), Munroe Tavern (circa 1695), the Hancock-Clarke House (1737), the U.S.S. Lexington Memorial, the Centre Depot (old Boston and Maine train station, today the headquarters of the town Historical Society), Follen Church (the oldest standing church building in Lexington, built in 1839), and the Mulliken White Oak (one of Lexington's most distinguished and oldest trees). Lexington is also home, along with neighboring Lincoln and nearby Concord to the 900-acre (3.6 km2) Minute Man National Historical Park. The Scottish Rite Masonic Museum & Library showcases exhibits on American history and Freemasonry. Lexington's town center is home to numerous dining opportunities, fine art galleries, retail shopping, a small cinema, the Cary Memorial Library, the Minuteman Bikeway, Depot Square, and many of the aforementioned historical landmarks. The Great Meadow, a.k.a. Arlington's Great Meadows, is a sprawling meadow and marshland located in East Lexington, but owned by the town of Arlington, Lexington's neighbor to the east. Willards Woods Conservation Area, a small forest of conservation land donated years ago by the Willard Sisters. Willards Woods is referenced in the classic Saturday Night Live skit "Donnie's Party". Wilson Farm, a farm and farm stand in operation since 1884. The Lexington Community Center is a meeting place for Lexington residents. Notable Lexington neighborhoods include Lexington Centre, Meriam Hill (and Granny Hill), Irish Village, Loring Hill, Belfry Hill, Munroe Hill, Countryside (sometimes referred to as "Scotland"), the Munroe District, the Manor Section, Four Corners, Grapevine Corner, Woodhaven, and East Lexington (fondly "East Village", or "The East End"). Marrett Square, at the intersection of Marrett Road and Waltham Street, is the location of some light shopping and dining. The "Old Reservoir," sometimes referred to by locals as "The Res," used to provide drinking water to Lexington residents and surrounding areas. Now it offers a place to swim and picnic in the summer time. In the winter, when it freezes over, it is used as an ice skating area. Book publisher D.C. Heath was founded in 1885 at 125 Spring Street in Lexington, near the present day intersection of Route 128 and MA Route 2, and was headquartered on that spot until its 1995 sale to Houghton Mifflin. The Lexington Community Center, opened on October 17, 2015. It is located next to the Headquarters of the Northern Masonic Jurisdiction of Scottish Rite Freemasonry. Pavel Etingof, mathematician, fellow of the American Mathematics Society, and professor at MIT. Russell Morash, pioneer of 'how-to' television, creator and producer of the PBS shows "The Victory Garden," "This Old House," and "New Yankee Workshop"
Cathy O'Neil, Data Scientist, Occupier and blogger at mathbabe. LHS Grad. Cecilia Payne-Gaposchkin, astronomer known for her work on spectral analysis of stars. Awarded the Henry Norris Russell Lectureship by the American Astronomical Society in 1976. ^ "Profile of General Population and Housing Characteristics: 2010 Demographic Profile Data (DP-1): Lexington town, Middlesex County, Massachusetts". U.S. Census Bureau, American Factfinder. Archived from the original on September 11, 2013. Retrieved April 6, 2012. ^ "These Are The 10 Richest Small Cities In America". Movoto Real Estate. Retrieved January 9, 2015. ^ a b Tracing the Past in Lexington, Massachusetts. Edwin B. Worthen. ^ "Lexington - Massachusetts, United States". britannica.com. Retrieved 14 March 2018. ^ "America's Top Schools - Lexington High School #19 in 2014". ^ "METCO FAQ". Massachusetts Department of Education. ^ Fischer, David Hackett. Paul Revere's Ride, pp. 184-232, Oxford University Press, New York, NY, 1994. ISBN 0-19-508847-6. ^ Biweekly Report for 29 July 1955 (PDF) (minutes). Memorandum 6M-3797. Lincoln Laboratory Division 6. Retrieved 2013-07-25. All XD-1 frames have now been delivered. The LRI and output frame3 arrived 29 July. ^ "Overview". SAGE: The First [computerized]National Air Defense Network. IBM.com. Retrieved 2013-05-08. the AN/FSQ-7…was developed, built and maintained by IBM. … In June 1956, IBM delivered the prototype of the computer to be used in SAGE. ^ Lemnios, William Z.; Grometstein, Alan A. (November 1, 2002). "Overview of the Lincoln Laboratory Ballistic Missile Defense Program". Lincoln Laboratory journal. 13. ^ "QT-P8: Race Reporting for the Asian Population by Selected Categories: 2010". factfinder2.census.gov. 2010 Census. Retrieved 1 June 2014. ^ "Lexington, MA 02421 Zip Code Detailed Profile". City-data.com. Retrieved 2016-04-09. ^ a b "Lexington, MA Income and Careers". Usa.com. Retrieved 2015-02-10. ^ Sacchetti, Maria. "A melting pot stretches out to the suburbs." Boston Globe. September 15, 2010. p. 2 (Archived November 11, 2014, at the Wayback Machine). Retrieved on September 23, 2014. ^ "2010 National Blue Ribbon Exemplary High Performing Schools" (PDF). U.S. Department of Education. ^ "2013 National Blue Ribbon Exemplary High Performing Schools" (PDF). U.S. Department of Education. ^ Past High School National Science Bowl Winners (1991 - 2016) | U.S. DOE Office of Science (SC). Science.energy.gov. Retrieved on 2017-05-06. ^ Hsiao, Teresa. "WEEKEND TRAINING" ( Archived 2015-09-07 at WebCite). The Patriot Ledger. July 2, 2003 (from the summary page(Archive). Retrieved on September 8, 2015. ^ "Lexington Symphony | Concert Venue: Cary Memorial Hall". Archived from the original on 2017-02-05. Retrieved 2017-02-04. ^ "Cary Hall | Lexington Symphony – Czechs & Diamonds – February 11". Archived from the original on 2017-02-05. Retrieved 2017-02-04. 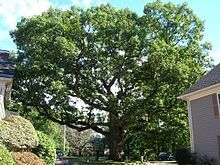 ^ "Distinctive trees of Lexington: Mulliken white oak". www.wickedlocal.com. May 29, 2010. Retrieved 23 April 2018. ^ "Directions to Dr. A's Office". drabraham.com. Retrieved 2 September 2015. ^ Hatheway, Allen W.; Newton, Elisabeth Guerry (2003). "Memorial to Alice Standish Allen, Honorary Member (1907-2002)". Environmental and Engineering Geoscience. 9 (2): 189–190. doi:10.2113/9.2.189. ^ Andrew L. Russell (April 9, 2011). "Oral-History:Charles Bachman". IEEE Oral History Network. Retrieved September 1, 2015. ^ "Forecasting Economic Trends with Precision". Technology Review. August 2005. Archived from the original on 27 January 2014. Retrieved January 27, 2014. ^ Simon, Cecilia Capuzzi (12 July 2005). "Mr. Mindfulness". Washington Post. Retrieved 31 August 2015. ^ "Famous folks from Lexington". Boston.com. Retrieved July 31, 2012. ^ Fox, Margalit. "Gerald S. Lesser, Shaper of 'Sesame Street,' Dies at 84", The New York Times, October 4, 2010. Accessed October 4, 2010. ^ "Catherine O'Neil". LinkedIn.com. Retrieved November 19, 2014. ^ Fischer, David Hackett. Paul Revere's Ride, pp. 149-51, 158, 160, 180, 182, 188, 191, 193, 197, 201, 203, 210, 228, 229, 285, 319, 395, Oxford University Press, New York, NY, 1994. ISBN 0-19-508847-6. ^ Commager, Henry Steele. Theodore Parker: An Anthology, Beacon Press, Boston, MA, 1960. ^ Commager, Henry Steele. Theodore Parker, Beacon Press, Boston, MA, 1947. ^ "Henry Norris Russell Lectureship". Retrieved March 20, 2015. ^ "In the World of Professional Gaming, Rumay 'Hafu' Wang Found Her Niche". NBC News. Retrieved January 12, 2018. History of Middlesex County, Massachusetts, Volume 1 (A-H), Volume 2 (L-W) compiled by Samuel Adams Drake, published 1879 and 1880. 572 and 505 pages. Lexington section by Charles Hudson in volume 2 pages 9–33 (note page 9 missing). History of the Town of Lexington, Middlesex County, Massachusetts,Volume 1 - History, Volume2 - Genealogies, by Charles Hudson, published 1913. Paul Revere's Ride, by David Hackett Fischer, Oxford University Press, New York, NY, 1994. ISBN 0-19-508847-6. 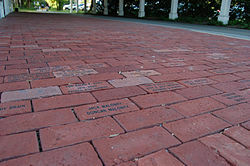 Wikimedia Commons has media related to Lexington, Massachusetts. "Lexington, a township of Middlesex county, Massachusetts, U.S.A." . Encyclopædia Britannica (11th ed.). 1911.